"Zionist Terror" is a basic theme among those who are uncomfortable with Jewish nationalism. The victims of it are either the British, the Arabs or both as well as peacefel Jews. Some people have even gone to extremes. Like Robert Fisk. On August 30, 2002, Robert Fisk published in the UKIndependent, and reposted it at Counterpunch a few days later, a column asserting that British troop loses in Mandate Palestine were “A Conveniently Forgotten Holocaust” and that the British Army's 1945-48 campaign in Palestine “has been 'disappeared', sidelined and forgotten”. The "Holocaust" he refers to is actually that of the Armenians but a not-too sophisticated reader would, I presume, be confused. 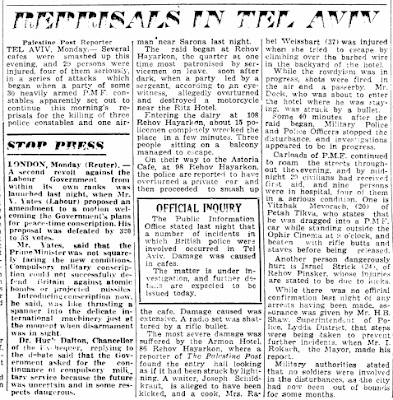 As for the British Army's campaign being sidelined, there is at least one very well stocked web site devoted to it, another of the Palestine Police Old Comrades Association, a roll of honour, dozens of books like "Military Resistance in Late Mandatory Palestine: The Activities of the Jewish and Arab Military Organizations as Reflected in the Reports of High Commissioner General Sir Alan Cunningham" and "Jewish Terrorism in Israel", and studies as well as research on British anti-Arab terrorism and on specific British units. You can even find Bruce Hoffman's PhD thesis from 1985, "Jewish Terrorist Activities and the British Government in Palestine 1939-1947" which morphed into "Anonymous Soldiers: The Struggle for Israel, 1917-1947". Issa Nakleh had an active encyclopedia of material, now a book, which also reviews Foreign Office telegrams from Palestine, the material that Suarez uses. Here's the PDF of the 1977 "Jewish-Zionist terrorism and the Establishment of Israel", by John L. Peeke. Already in 1949, "Cordon and Search" was published and has been reissued. It is the official history of Britain's 6th Airborne Division in Palestine from 1946 to 1948 and includes charts of actions of Jewish resistance guerrilla operations. 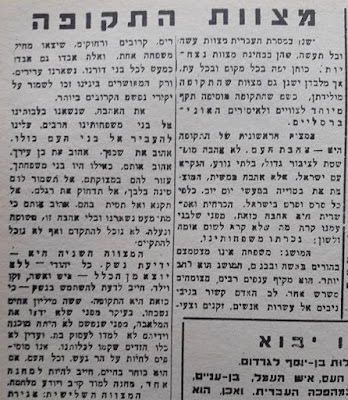 The High Commissioner's official and personal correspondence is researched by Motti Golani, himself quite unsympathetic to the Irgun and Lechi. We can add J. Bowyer Bell's 1978 Terror Out of Zion and David A. 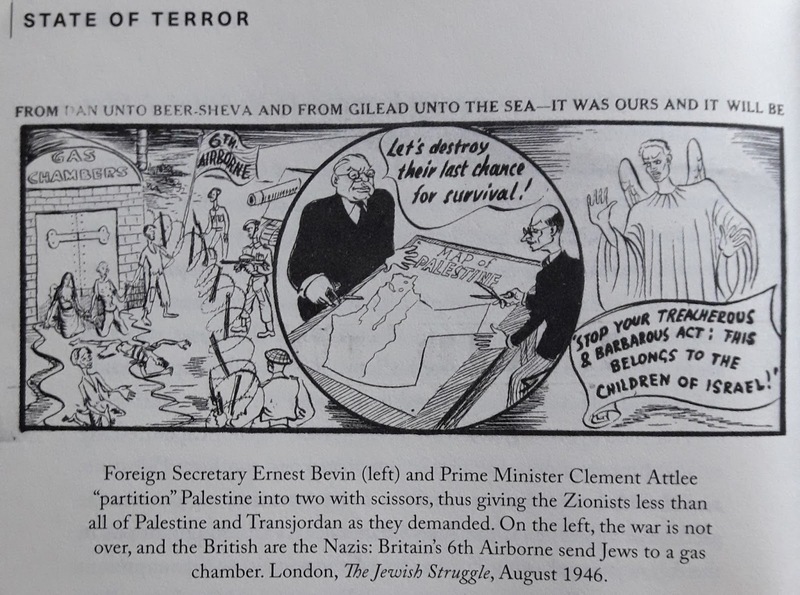 Charters' 1989 "The British Army and Jewish Insurgency in Palestine, 1945-47". Some of these studies, all more rigorously researched that that of Suarez, are listed in his bibliography. Too many others, not. For example, Menachem Begin's "The Revolt" is not nor Shmuel Katz's "Day of Fire". Except for Yosef Kister's listing of Irgun operations, no source from within the "Zionist terror" commanders or operatives did I find. None in Hebrew. This is not a serious approach to study such a subject. In other words, Suarez is fooling his readers as to his academic competence and ability to deal with "Zionist terror". ...meticulously researched book...the violent takeover of Palestine by Zionism, a European settler movement hailing from the era of ethnic nationalism. Such language is not one of a neutral or objective scholar and Suarez's book, praised by make-up historian Ilan Pappé, and a sloppy one, and the anti-Semitic-tainted Baroness Jenny Tonge, certainly is not such a scholarly volume despite the material he includes. (As for "never before published", I find such a claim baseless and see the partial material I listed above). To borrow a phrase from Benny Morris, Suarez has an aversion to Zionism. And he had that before writing this book. This book is not the result of quality research but of his aversion too anything connected to Zionism, even legitimate self-defense. It is tainted in addition to be lacking in historical perspective, the presentation of a comprehensive perspective of the history of the British Mandate for Palestine period, the actions of the Arabs and the actual events which resulted from the violence perpetrated by Jews. Tom Suarez has complained that "a Zionist campaign of distortions" has interfered with his speaking tour to promote "State of Terror". Audiences, he decries, are being deprived of learning of his research conclusions. Suarez, a professional violinist, seems to have been more engaged in cacophony than harmony in writing his book but that I have to prove. 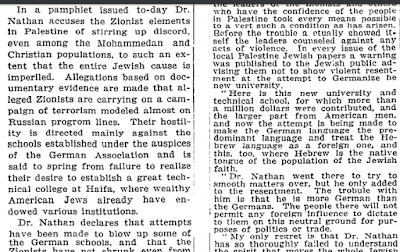 The use of terror by Jews in Mandate Palestine has been rigorously and academically treated as I noted. In 2012, Professor Eliezer Tauber published "Military Resistance in Late Mandatory Palestine, The Activities of the Jewish and Arab Military Organizations as Reflected in the Reports of High Commissioner General Sir Alan Cunningham". The book meticulously covers the activities of the Jewish and Arab military organizations in Mandate Palestine from early 1947 to mid-May 1948 using telegrams with the detailed daily reports sent back to London. A portion of these telegrams, although destroyed by the British after they had left Palestine, was recovered especially for this edition. I mentioned above a first-hand British source, "Cordon and Search", and there is a dedicated web site of the Sixth Airborne Division. Back in 1993, Nachman Ben-Yehudah published "Political Assassinations by Jews". Other books on the subject include the 1979 "The Palestine Triangle: The struggle for the Holy Land, 1935-48" by Nicholas Bethell, "Resistance and Tradition in Mandatory Palestine" by Hilda Schatzberger, "Havlaga u'Tguva" (Restraint and Reprisal) by Yaakov Shavit and many more, both in English and Hebrew. Issa Nakhleh uploaded years ago in four chapters the daily House of Commons reports and Foreign and Colonial Office announcements in his "Encyclopedia of the Palestine Problem" which has been embellished over the years. True, Suarez does include new material. 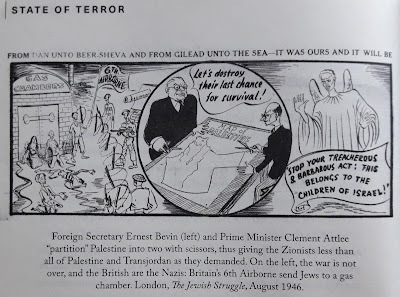 For example, on page 158, he reprints a caricature for an Irgun mouthpiece in England, The Jewish Standard, a journal of that time ignored by researchers. Unfortunately, while I am sure he reads music being a professional violinist, he seems unable to comprehend the cartoon. He claims that it shows the "British are the Nazis" by portraying English troops in Europe "send[ing] Jews to a gas chamber". It is not hard to see that the troops are actually simply keeping the Jews in camps, after they have escaped the gas chambers, detaining them and preventing them from reaching Palestine. Jews, in other words, learned from the Jew-haters and then turned around and treated Arabs in the way in which they had been treated. And that is a perverse reversing of history. And with Suarez being praised by Ilan Pappe, how can he expect to be taken seriously? 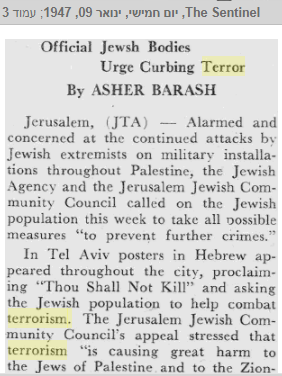 My suggestion is that indeed, terrorism did create modern Israel. However, it was the terror that was executed, carried out and wreaked on the Jews returning by right to their historic homeland by Arabs - and Arab terror inflicted on fellow Arabs - that, as much as any other factor, assisted in the creation of the modern state of Israel. In addition, the adoption by the Mufti of a pro-German Nazi policy at least as early as 1933 as well as exploiting Nazi ideology and propaganda themes and then serving Hitler during World War II in Baghdad and Berlin, contributed to the mass murder of European Jewry. Not terror but a Holocaust participant. All of the above, along with errors of research and presentation, is at the root of this book. What follows is a selection of highlights of the many items I found while reading the book with my comments. There is no other way to illustrate how evil this book is (see other documents here) except by delving into the seemingly inconsequential, minor and even bothersome details. The 1943 quotation at the beginning, frontispiece (? ), from the words of Wolfgang Yourgrau, that fascism is growing in Palestine lacks the information that Yourgrau, while Jewish, was mainly active with the Socialist Labor Party of Germany (SAPD), was a non-Zionist, promoted socialist anti-fascism and published The Orient. He was described as belonging to "the group of disaffected left-wing socialist emigres" and see Adi Gordon's work and his book. He was never truly at home in Palestine, was an anti-Zionist and anti-Hebraist, assumed an 'outsider' posture and in 1948 left for South Africa. p. 13 - to absolve the Arabs of Mandate Palestine of any responsibility or their refusal to adopt a diplomatic resolution of the conflict by the UN, the Partition Proposal Resolution 181 is simply "a scam". What that has to do with the book's subject is odd. p. 23 - the Hebrew usage of the therm "Third Temple", HaBayit HaShlishi, by the 99.9% of Zionists at the time had nothing to do with the Temple per se but was a synonym for a renewed Jewish Commonwealth in a secular frame. p. 29 - Jews living on the land are engaged in the "extranationalization of land, resources and labor, excised from the shared Palestinian inheritance". Besides silly verbiage, the use of "Palestinian" by Suarez is exclusively in reference to Arabs, not Jews even if they were born there and had lived there centuries prior to Arabs. I think that is racism. BERLIN, Jan. 22. 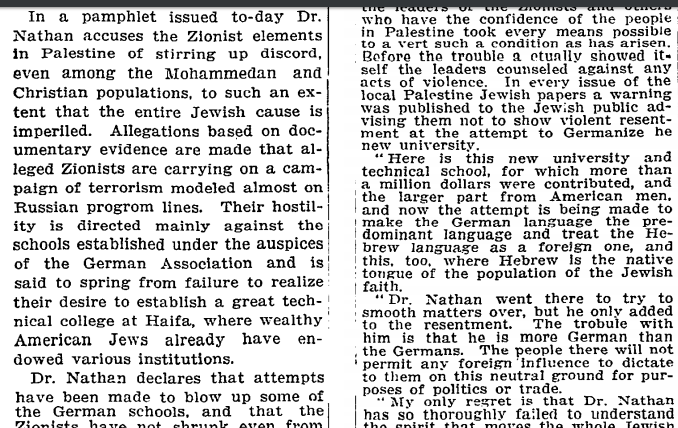 -- "All hope of repeopling Palestine with the persecuted children of Israel, exiled in other lands, must be abandoned as utterly impracticable," said Dr. Paul Nathan, President of the German Jewish Relief Association, in an interview with the NEW YORK TIMES correspondent. In other words, Nathan is talking about apples and Suarez wants you to believe he is referring to pears and we'll ignore the "impracticable" aspect and what happened to German Jews 20 years later. 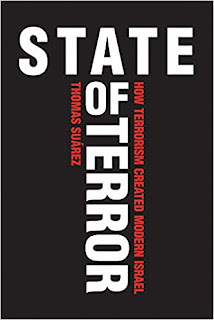 The "terror" was not at all the "terror" he is presenting in his book. This dependence on classic anti-Zionist myths which very few can detail a rebuttal is a constant tool of the book as well as a plain falsification of the historical narrative. p. 49 - over and over Suarez writes of "racially segregated statehood". That Jews belong to multiple races means nothing to him. 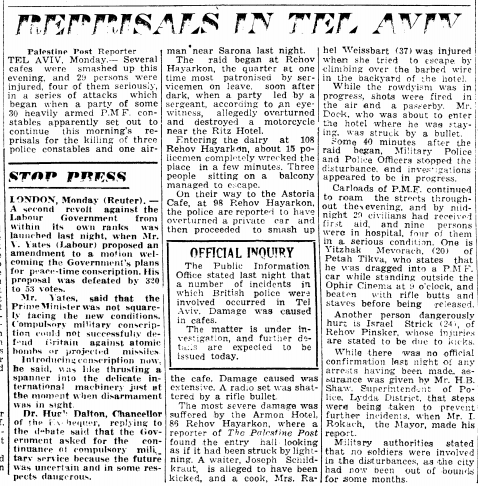 - He writes that the Zionist establishment "rejected the [Peel Commission's 1937 Partition] plan". It did not. It negotiated it even until it became official British policy in May 1939. The Arabs rejected it from the outset. The Jews were seeking more amenable territorial configurations. p. 50 - all of a sudden, without much context, an "uprising" occurs in 1936, that includes "Palestinian terror" (that "Palestinian" means "Arabs" is another of Suarez's tricks. That Palestinian nationalism was the the result of the Mandate for the Jews, Article. 7 and note this). Was there terror previously? Before 1920? In April 1920? May 1921? August 1929? October 1933? And in between? Unlike the "Zionist gangs", did the Arab terrorists really not enjoy protection of villagers? - On p. 52 we learn that three Jews were shot on April 15, 1936 and two died. That's it? No further details? But what did a newspaper report? Izz ed Din? This person? p. 53 - the Irgun "attacked what it called 'mob rioters'". What were they? Peace activists? Demonstrators demanding higher wages? What happened in Jaffa in mid-April? 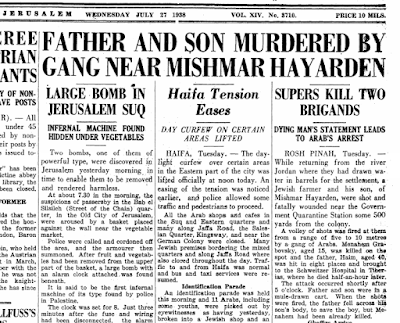 The Irgun violence was totally divorced and disconnected from Arab violence? That Arab violence did not initiate a reaction? Did he, perhaps, not wish to portray Arabs stabbing and slicing a person as that might reflect negatively? p. 62 - he employs language that is disconnected as in "ethnic tensions" in Haifa. There was an attempt by Arabs, yet another, to violently reverse the Balfour Declaration and the League of Nations Mandate decision. It was either political or religious but not ethnic (there are Ashkenazi/European Jews and there are Mizrachi/Oriental Jews). And further down the page, "Palestinians" (again, Arabs; Jews are never Palestinians) can understandably "retaliate" but Jews cannot in his terror litany. p. 63 - at page bottom is a list of Jewish actions but no parallel Arab incidents. No balance in the simple factual chronicles of the period. Over 500 Jews were murdered, not to mention injured, raped and beset upon. Fires, pillaging, uprooting. No mention. p. 65 - the Sinbad sinking is unidentified as to its perpatrators. It was the Hagana. 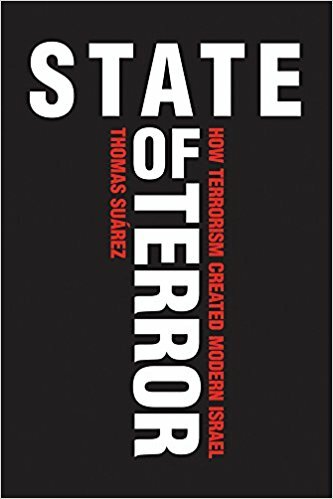 p. 66 - one of Suarez's favorite techniques is to quote someone, a correspondent, a British official, an anti-Zionist, who refers to Zionists as Nazis, Nazi-like, etc. Like on this page where the Irgun "is formed on Nazi lines". Meaningless, especially as it is pre-WW II. p. 68 - and on the other hand, he doesn't call Arabs terrorists. There are Arab "robber gangs" who happen to kill. p. 78 - without proof or foundation, he asserts that the voluntary enlistment by Jews into the British Army in WW II was so that they would not be "as equal soldiers in the common front". There are ten and not one of them encourages people having children. In two of them, the Irgun member acknowledges he must be ready to sacrifice his life in battle. There is a footnote, 157, which directs the reader to the Irgun's broadsheet, Herut, No. 59, July 1946. So I checked that and sure enough, there is an article entitled, "Mitzvot for This Time"
[this one] has never been more important, more sacred and more necessary for the existence of the nation and to assure its future, now more than ever, when one-third of the nation's living beings has been erased in a nightmare and it is: to progenate. In other words, Suarez takes a fairly innocuous suggestion, one quite understandable after millions of Jews were murdered and extirpated, including Begin's infant nephew, mother and father (the latter dumped in the Bug River with stones bound around his neck) and out of context, as if an "Irgun Commandment", and turns it into a racist rant without any basis, using "pure" which isn't in the text. That is what I meant by this being an evil book. 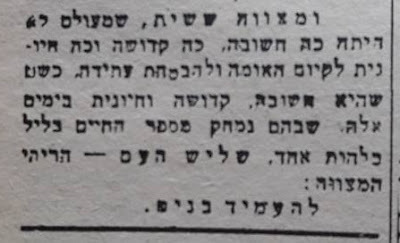 p. 86 - he claims members of Lechi opened fire in a clubhouse of HaShomer Hatzair "in retaliation for that socialist party's favoring a binational state". While HaShomer HaTzair was also a political party (it eventual merged into MAPAM) this was the youth movement's clubhouse. The Lechi members came to distribute pamphlets. They were physically attacked and one person drew his revolver and fired one shot into the air to allow them to escape. I know that person who is still alive. Suarez is suggesting something nefarious such as intra-communal terror but that was not what happened, not as he would have us believe. And if any side was attacked, beaten and also handed over to the British, that was during the two Saison operations of 1944-45 and summer of 1947 (and see p. 98 below). p. 87 - he quotes from a note attached to a memo written by a British official that Palestine will be made a "Jewish state" as if something in that is wrong or against the intention of the League of Nation rather than the reneging of the British on that intent. p. 87 - footnoting "Kister 112", he lists the Irgun bombing government buildings in Jerusalem the evening of January 14-15, 1944. I presume he means an attack on the Steel Bros. Garage in Jaffa, an independent unauthorized action by three Irgunists, impatient for the start of the Revolt, which began on February 1. Simply sloppy as he does compare details' veracity in other cases. p. 88 - He characterizes HaTzofeh as "the then-popular paper". 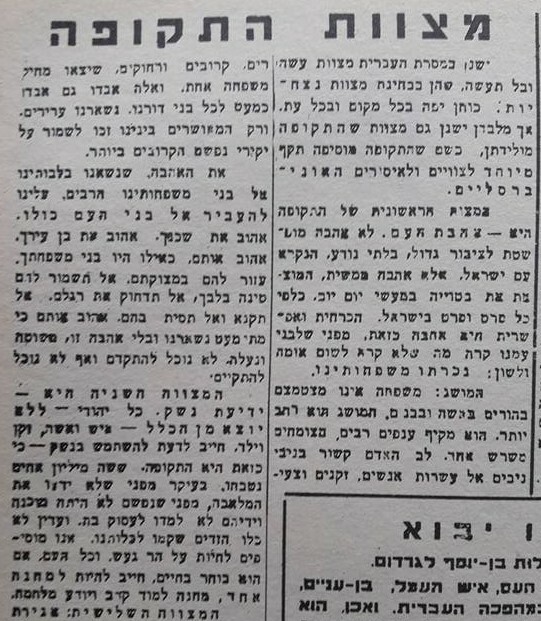 Without disparaging the paper, it was the party organ of Mizrachi, the National Religious Party, and while it might have been popular amongst that section of the populace, Haaretz, Davar, HaBoker and HaMashkif easily had more popularity. p. 90 - For him, there exists "Zionism's 'blood ownership' of Jews". What this means, I do not know but can only surmise that he ties it to German and Nazi nationalism. 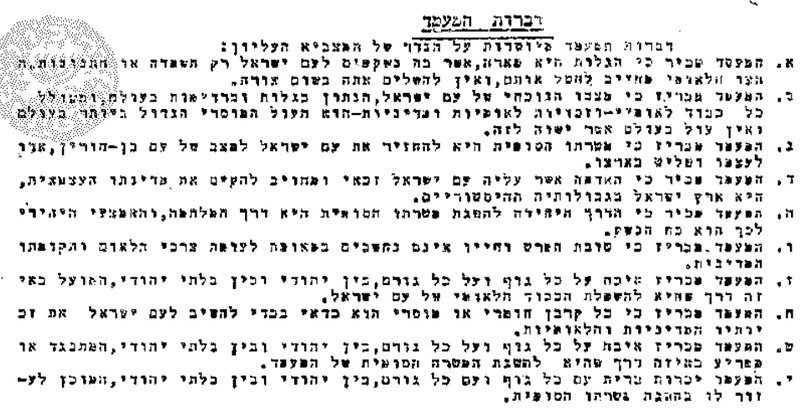 p. 95 - the moderate Chaim Weizmann is termed by Suarez as "relentlessly messianic"! And on p. 114 he again employs "messianic" without any proof. 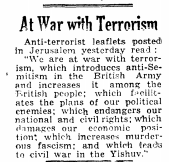 On p. 157, the Irgun's US support group placed "messianic advertisements" in newspapers. What does he mean exactly? Or is he just besmirching? On p. 190, the Jewish Agency employed "bluntly messianic terms". the establishment within 10 years of an independent Palestine State...in which Arabs and Jews share government in such a way as to ensure that the essential interests of each community are safeguarded...Jewish immigration during the next five years will be at a rate which...will bring the Jewish population up to approximately one third of the total population of the country...After the period of five years, no further Jewish immigration will be permitted unless the Arabs of Palestine are prepared to acquiesce in it. The position of Transjordan provided some difficulty, especially concerning the question of a Jewish homeland. It was agreed that the Balfour declaration should not apply to Transjordan, and that there should be a separate High Commissioner for Jordan although he should be the same person as the High Commissioner for Palestine. The British appointed a resident to Transjordan, but he was effectively under instructions from the British High Commissioner in Palestine. p. 120 - he has the Jewish Agency engaged in a campaign of "kidnapping Jewish children" from European DP camps, without a source, so as to bring them, supposedly against their will, from post-Holocaust Europe to a future Jewish state yet on the next page he writes of the DP's "fanaticism". On p. 122, vilely he portrays Chief Rabbi Herzog as kidnapping the children, who, by the way, were handed over to Christians and to Christian institutions for safe-keeping until the parents could return to reclaim them but being incinerated, they couldn't. And on p. 124, following this theme through, he describes Rabbi Herzog as "gathering ethnically-correct human fodder for the settler nation". p. 126 - he quotes a sum of money as "(P?)£6000". Why the question mark? Does he not know that the currency of the Mandate was the Palestine Pound? p. 132 - in the space of five lines, he names a bridge as both "Na'aman" and "Na'Amin". It's properly "Naaman". 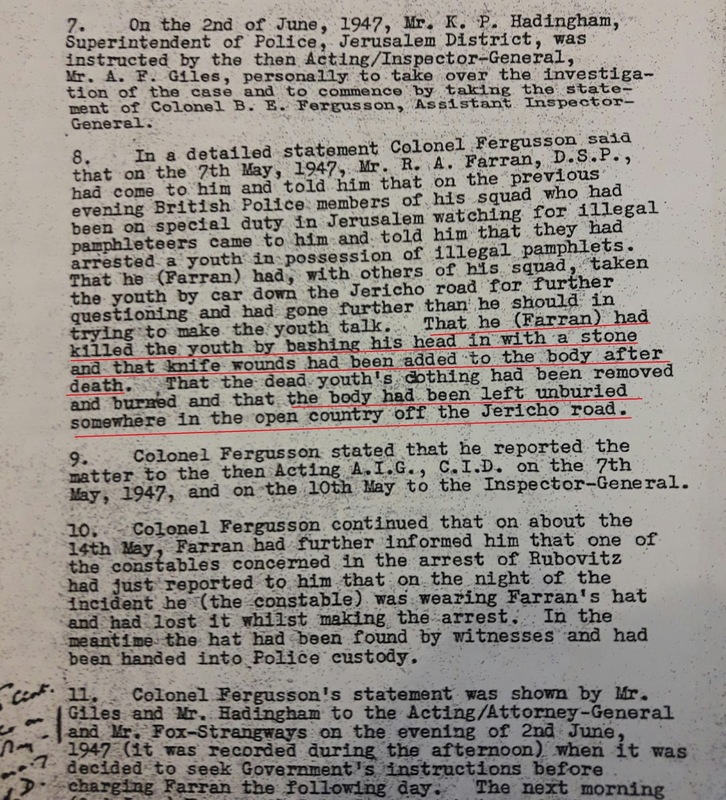 p. 133 - he identifies the attackers on a British car park encampment on April 25 as being "Irgun operatives". They belonged to the Lechi. p. 135 - "settlers held up a cafe" thereby using language that would identify 1940s terror with "hilltop youth" et al. p. 135 - Dr. Israel Eldad of the Lechi is described as "a key assassin". He never handled a gun, ever. p. 143 - Suarez claims, based on a British report, that the explosion at the King David Hotel on July 22, 1946 was "timed for when 'the maximum number of people were in the building'" (and on p.145, the Irgun "timed the bomb for when the area was most populated" and this based on his interviewer with a 'survivor'). All planning personnel from Begin, to Sneh, to Paglin, etc. all stressed that the choice of time - after breakfast clean-up and prior to the lunch crowd - was especially decided on to reduce any possible casualties. Warnings were multiple: calling to the Hotel, the nearby Consulate and the Police; throwing petards in the street (then, Julian Way); and a long delay of 30 minutes. Nothing wrong in quoting the report but to bring the other side which is well-documented? p. 144 - continuing with the King David Hotel bombing, he includes a fanciful "Irgun operatives...removed the reception clerk" that never happened. Has he not read Thurston Clarke's book? From p. 111 here? p. 145 - he continues his ignorance suggesting that only a day before, on July 21, did Begin, Friedman-Yellin, Sneh and Itzhak Ish-Shadeh meet in Tel Aviv and "drew straws" to decide which "gang" would carry out the operation. This is so silly. The decision of the United Resistance Movement's Committee X was made on May 15. The go-ahead authorization was delivered to Begin on July 1. Does Suarez really believe such an operation can be carried out in but one day's training and planning? 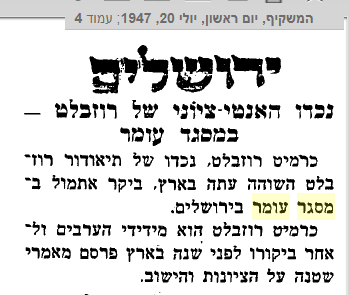 Oh, and Itzhak Ish-Shadeh was Yitzhak Sadeh. p. 159 - in the October 31, 1946 bombing of Jerusalem's Train Station, a "girl [is] carrying three suitcases loaded with high explosives". No. She, Simma Hoizman, didn't carry even one: other Irgunists disguised as Arab porters did. How could she carry over 100 kgs. of dynamite? p. 160 - he quotes a source that "about twenty persons came from Palestine" to carry out the bombing of the British Embassy in Rome. Actually, there were but two and one was Yaakov Tavin, who I knew. p. 164 - the normative practice of most Jews at he time, including the very non-observant, all used the Hebrew calendar but for Suarez, the Irgun dating a report Tishrey, the first Hebrew month of autumn, is "Biblical pretense". p. 191 - a tactic with a long history, placing explosive against a building, is approvingly quoted by Suarez as being "successfully used by the Germans in 1940". Anything to tie Jews to Nazis. 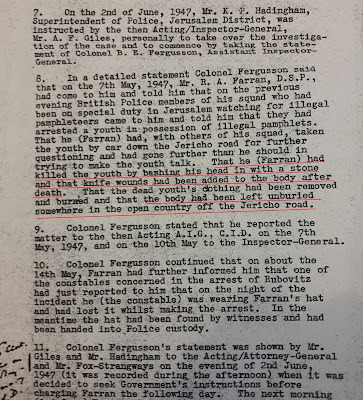 Similarly, on the next page, the D-G of MI5 is quoted as estimating that Betar "bears a striking resemblance both in general structure and character to the Hitler Youth Movement". The first murder of a[n Arab-by-Arab] public figure occurred in 1929, near the Jaffa Gate in Jerusalem. Sheikh Musa Hadeib hailed from the village of Duwaimah, in the Hebron foothills, and he may have sold land to the Jews. But his chief sin was political: he spoke out in favor of the British Mandate, and he had once hosted the High Commissioner Herbert Samuel. 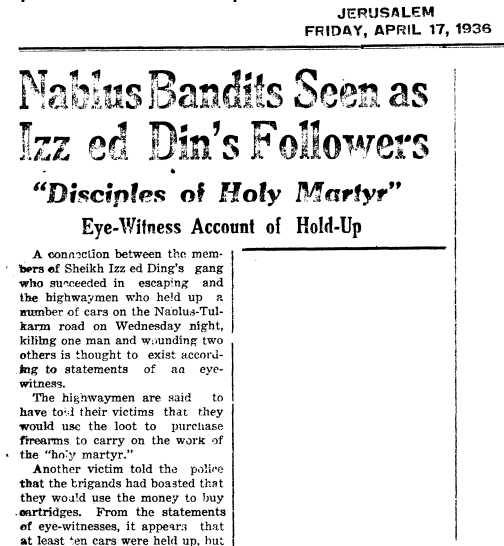 He had also helped to found the Zionist-supported "Muslim National Associations" in the 1920s, as a counterweight to the Muslim-Christian associations that were hotbeds of anti-Zionist nationalist agitation;...The killing occurred in October, less than two months after the wave of anti-Jewish pogroms that swept the country--"the 1929 Disturbances," as the British (and the Zionists) called them, though in the collective memory of the Arabs they are known as the first "Arab Revolt"--which were triggered by Arab fears, methodically stirred up by Hajj Amin al-Husseini, that the Jews intended to "take control of" the Temple Mount, or al-Haram al- Sharif, and destroy the two sacred mosques in the compound, Al Aksa and the Dome of the Rock. By the mid-1930s, the Husseinis had discarded all inhibitions (such as the traditional fear that a murder would spark an open-ended blood feud with the victim's clan). The first murder of a land speculator, or simsar, was recorded in November 1934, with the shooting of Saleh Isa Hamdan, of Lifta, outside Jerusalem. The killers are "people extremely close to Hajj Amin," the police reported. 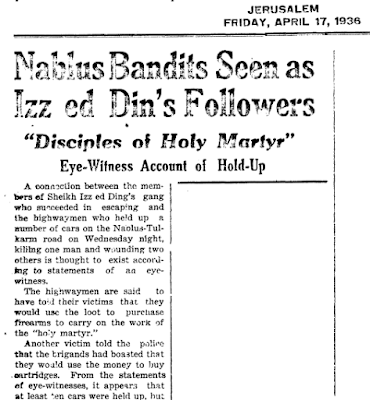 During the rebellion of 1936-1939, when Husseini assassinations of political opponents and anyone suspected of any type of collaboration crested, about 1,000 Arabs were killed by fellow Arabs, about 500 of them in 1938 alone. (By comparison, about 1,100 Arab rebels were killed in 1938 by British, Zionist, and anti-rebel Arab forces.) 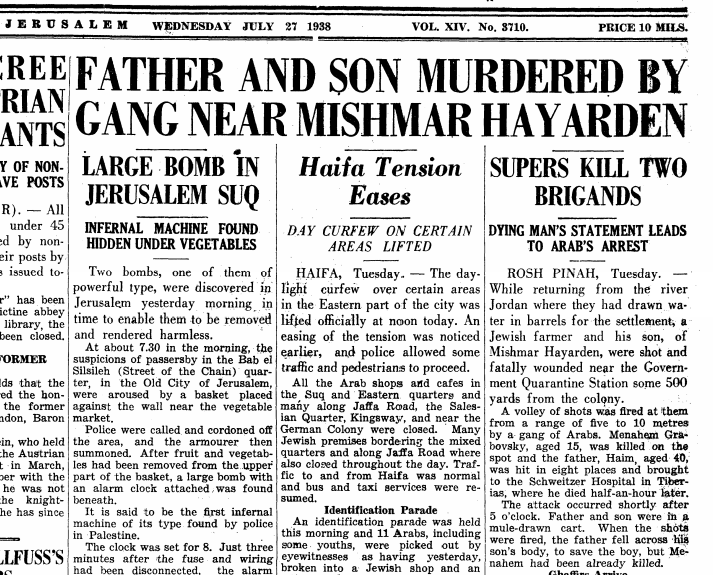 By 1939, the Husseinis were paying 100 Palestine pounds to operatives for the killing of high-level "traitors" and 25 pounds for lower-level "traitors." Killers of Jews earned only 10 pounds. Perhaps this partly explains why "only" some 500 Jews were killed in the course of the revolt. p. 201 - weirdly, he claims that as early as January 1943 "the Jewish Agency's campaign to displace (!) North African Jews" began. But then you must realize that he means displacing North African Jews from...North Africa. In other words, the core principle of ascending to the Land, i.e., Aliyah, is really an act of displacing Diaspora-domiciled Jews (remember his "kidnapping" claim of Jewish European orphans?). What would he say of the Tzuf Dvash, Rabbi David ben Shimon ninety years earlier? Born in Morocco, in 1854, at the age of twenty eight, he moved to Jerusalem together with several of his disciples, and he quickly became a leading figure within the Moroccan Jewish community. He established the Tzuf Dvash Synagogue in 1860, and participated in the establishment of Mishkenot Shaananim. He decided to establish the separate "Edah HaMaaravit B'Yerushalayim" community. He settled in 1867 on a lot he had purchased outside the walls of the Old City, Mahane Israel, behind today's Waldorf-Astoria Hotel, where the 1868 restaurant is. Two synagogues, several Batei Medrash (houses of study), and other institutions were built there. His Moroccan followers were soon followed by Jews from other North African countries. p. 205 - again, a semantic sleight: he writes that Moshe Sharret "stated bluntly that the Jewish Agency would never accept equality ("unity") with the Palestinians, justifying the discrimination...denying the ethnic cleansing that he thought his audience...feared...". Firstly, that "unity" meant that the Jews would not have an independent state. Secondly, the "equality" Suarez prefers, combined with his use of "discrimination", is snarkly meant to convey a charge of racism, which it wasn't. I mentioned the 1939 White Paper above and it read a state, not a Jewish national home, would be established "in which Arabs and Jews share government". In other words, the "equality" refers to the fact that Sharret opposed the establishment of yet another Arab state while Jews would not have a state of their own. p. 211 - without any sense of decency, Suarez quotes, seemingly approvingly and without any critique as to its reliability to what actually was the reality, a British report on the SS Exodus that was run by "quite a little Nazi organization - complete with muscle-men, group 'fuhrers', and capped by Hitler himself", referring to the ship's captain. p. 219 - anti-Semitism does not exist independently of Zionism, Suarez claims, but, for example, an anti-Jewish pogrom in England after the hanging of the two sergeants in the summer of 1947 was "but one illustration of Zionism's self-fulfilling and self-perpetuating cycle of of anti-Semitism". The Jews are guilty of causing hate to themselves, on purpose. By the way, he mentions the incident again on page 224 but does not identify it at all, not Hawari nor Hawaii. p. 225 - Arab terror since 1920 is referred to as "indigenous resistance". On page 226, it is called acts of "refusal to reward Zionist terror". p. 228 - he notes the British adoption of the term "thugs" instead of "terrorists" as "terrorists" was being associated with...glamor. There was no Zionist plan or blanket policy of evicting the Arab population, or of “ethnic cleansing”. 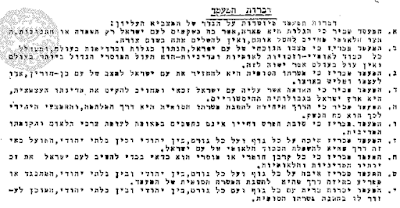 Plan Dalet (or Plan D) of March 10 1948 (it is open and available for all to read in the Israel Defence Forces (IDF) Archive and in various publications) was the master plan of the Haganah – the Jewish military force that became the IDF – to counter the expected pan-Arab assault on the emergent Jewish state. That's what it explicitly states and that's what it was. And the invasion of the armies of Egypt , Jordan , Syria and Iraq duly occurred, on May 15 1948 (the date of Israel 's declaration of independence). It is true that Plan D gave the regional commanders carte blanche to occupy and garrison or expel and destroy Arab villages along and behind the front lines and the anticipated Arab armies' invasion routes. 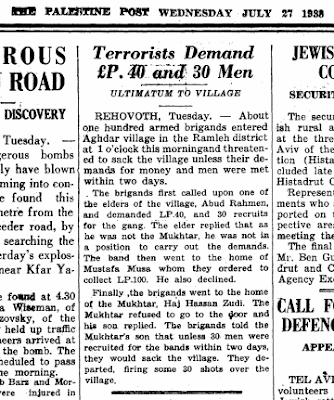 And it is also true that mid-way in the 1948 war the Israeli leaders decided to bar the return of the refugees (those “refugees” who had just assaulted the Jewish community), viewing them as a potential fifth column and threat to the Jewish state's existence. I for one cannot fault their fears or logic. p. 235 - Kermit Roosevelt's 1948 words that the "partition was refused acceptance as a final settlement by the Zionists" is odd. After all, its text provides for a transitional period prior to independence. Second, the special regime for Jerusalem was to last but ten years. And third, the Arabs refused it the day it was voted on. The Jews did accept it but realized that with the Arabs not only politically refusing but militarily rejecting the plan there was no reason to be more holy than the...Caliph. He continues in rewriting history on page 236 having us believe that partition was a capitulation. In one sense it was, but in comparison to what was originally envisioned in 1917-1922, it was the Arab terror that forced Gt. Britain in 1939 to capitulate to it. Suarez manages, again, to present things backwards and wrong. a hypothetical united Fertile Crescent state. The proclaimed area extends roughly over the medieval Arab Caliphate province of Bilad al-Sham, encompassing the Eastern Mediterranean or the Levant and Western Mesopotamia. with no room for a Jewish state. Why should he mention that? Would it implicate either the Syrians or the Hashemites in seeking to eliminate Israel in favor of a Greater Syria? UPDATE: Kermit founded a CIA-sponsored anti-Israel NGO AFME. p. 241 - he turns history on its head quoting without comment or doubt that "the Arab Higher Committee as a whole, and the Mufti in particular...wanted non-violent resistance" in the days after the UN vote when Arab shooting had caused numerous casualties already. In the second paragraph after this he insists that "peaceful Palestinian protest...marked the aftermath of the Partition vote". Yet in note 483 he notes there were "major acts of Arab...violence in the first week of December. p. 244 - a caricature critical of Arab behavior towards the Jews in Palestine is labeled as a "dehumanisation". p. 246 - Not Mahan Market but Machaneh. p. 253 - based on unreliable and inadequate sources, he writes of a Hagana agent injecting typhoid into the water system of Acre. p. 253 - again, uncritically, he allows this: "The 'Jewish Army'...based on the German organization in the years 1935-1936 (!)". p. 266 - he charges that Lechi's assassination of Count Folke Bernadotte, the UN negotiator, was with the "tacit blessing of the Israeli military". It wasn't. p. 268 - Deir Yassin village suffered an "extinction", he writes, going way further than a "massacre " and it wasn't that either. p. 269 - in mentioning the "levelling" of Arab villages, the leveling and destroying of the Gush Etzion kibbutzim or Bet Haaravah or Neveh Yaakov or Atarot, Jewish communities erased is skipped over. p. 275 - to his credit, he writes that the 'West Bank' was occupied by Jordan. p. 276 - in addition to ethnic cleansing, Israel engaged in "natural selection" of non-Jews. And Israel is "still expanding", he writes, this after withdrawal from Sinai, disengagement from Gaza, acceptance of Oslo Accord A and B areas. I surely do not agree that all is false in Suarez's book. But its direction, what it does get wrong, what it avoids and ignores, what it hides and more all indicate a propaganda broadside and and quite incomplete history not even supportive of his main reason for writing. Suarez is engaged in trashing history and misrepresenting narrative and even altering facts. Beware. This is a dangerous book. Now another response but I need to review it. "...Jesus Lane Meeting has a long historical relationship supporting Palestinian refugees dating back to the early 1970's and we continue to engage on the issues in the Middle East...some of us have attended the talk by Tom Suarez, which was relocated, or watched a recording of it. Some have purchased the book and read it. Friends (Quakers) who have read the book or seen the video recording of Tom’s talk have no reservations about Tom Suarez or his work. The Meeting has now arranged for a public talk by a recently returned Human Rights Observer with the Ecumenical Accompaniment Programme in Palestine and Israel run by the World Council of Churches. We look forward to learning more about the current situation as reported from a source we trust."